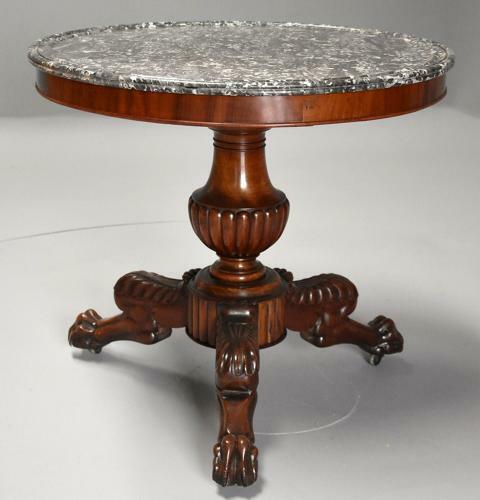 The table consists of the original marble top, this being a black and white veined marble, possibly Vert Maurin, with a moulded outer edge supported by a mahogany frieze with moulded edge below. This leads down to a turned and finely carved baluster column with gadroon carving supported by a tri-form base finely carved in the typical French Empire style consisting of three superbly carved legs with scrolling foliate carved decoration, terminating with carved paw feet and brass & porcelain castors. The Vert Maurin marble was sourced from the Alpes-de-Haute-Provence in France and is no longer quarried, it was used in the making of many types of decorative items in the mid 19th-early 20th centuries. This table and marble top are in excellent condition for age, are of stable construction and can go straight into a home.